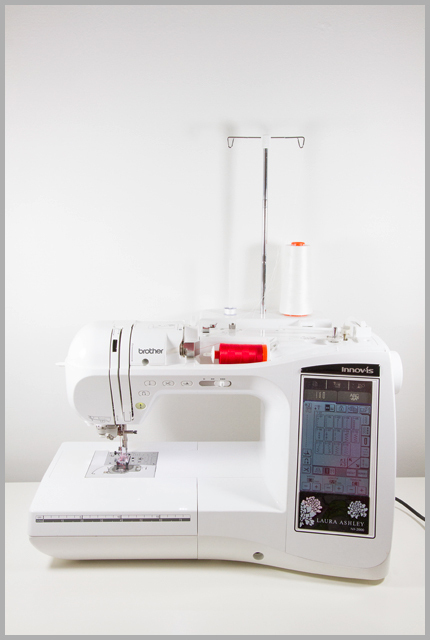 Sewing Machine Servicing – How Often Do You Do It? Anywho, I’ve been thinking for about a year and a half that I should probably get Big Brother serviced, you know, following on that annual car service logic, but I never quite got to it, I *needed* him for things and just couldn’t get my act together well enough in advance when I was heading away on holiday to send him off for his own personal spa. Finally, I planned well enough in advance that the day before I jetted off for Market I left him with my gran for the courier to collect him and take him to be serviced the next day. “Yes, he is,” and also clearly having a gender identity crisis. Poor guy. 100 hours. Right. I managed not to laugh at him down the phone. I’d be bankrupt if I was paying for services that often (in a year it would cost considerably more than the machine, I calculated). “Uh huh.” I said, somewhat non-committally. “Well I change it after every project,” I offered, feebly, and got a gold star for that at least. He went on to tell me about the bit of thread he’d removed from the upper section (where you can’t get to without surgery), and a couple of bits they reset, but otherwise, all was very good, considering I’d apparently driven poor Big Bro into the ground. Anyway, it begs the question, how often do you get your machine serviced? P.S. Baby Brother has never had a service. Shhh, don’t tell the man! I do clean Big Bro regularly, but that's about it! I've had my machine serviced twice in 12 years. Both times it came back missing something (the last time it was the power cord – which I had labelled with my name and address!) Needless to say, I'm hesitant to bring it in for service. But, I know I should be doing it – and soon. This time, though, I'm removing anything that is removable, and maybe I'll duct tape the power cord to the side of the machine. I have two cheapies I will never service. It's just not worth it financially. The machine itself would could be replaced with the cost of 2 services. One isn't working. I'm leaving it for the hubs to take apart and study instead. Never, I was going to run and hide in shame but it seems I'm not the only one! I send my Brother once a year for oily treatment and vacation, lol. It is not expensive though. The courier charges are higher than service itself. I've had my Janome about 15 months. Trying to decide if it needs to go "on vacation" when we go "on vacation". Maybe! But remember to plan ahead and not always leave it til the day before to think about it like I usually do! I have a Brother PQ1500s and I take it apart myself. There is a tutorial on one of the Yahoo groups that tells you all the places to lubricate with either a 'jelly' (forget the name) or with sewing machine oil. I have not had any trouble with it and it it about 6 years old…I also have a Viking Embroidery machine and I've cut down considerably on the servicing….just toooo darn expensive! I love auto correct and would love to send my husband to be serviced. But I meant husqvarna. That made me laugh so much! My hubby would cost me too much to send for a service … and like my machine he'd be difficult to manage without for too long! Heard so many horror stories, I am loathed to spend money for it come back poorly when it is running fine (3 years in) with no problems. But I have been thinking about it, does that count!? My Juki has been service once in 7 years! I clean it, oil it, keep it happy, and give it new needle every new quilt piecing project! My Bernina! Well that is a prima Donna who demands a service every 750,000 stitches! Now she is relegated to classes only! I find it hard to let go of my machine long enough to take it in, but I usually try todo it annually. I had mine (husqvarna viking) serviced for the first time about a year and a half ago, choosing to do so after a sewing marathon involving black wool capes. I hope to get it done sometime this summer. I've had my Brother for 8 years and have never professionally had it serviced. The local store wants $180 for a "yearly" cleaning. I did being it in once for repair when my bobbin winder quit working. Spooky, I've just been thinking i have to take my machine is for a service. I aim to get my machine serviced once a year but it seems to end up being every 2 years. Of course they want you to bring it in every 100 hours! 😉 I'm not the poster child of responsible sewing, but the last time I brought mine in for a repair, it came back completely out of alignment. I had to bring it back in immediately to have them adjust it again. You'd think that would have been part of the repair service? When servicing comes close to the price of the machine (like it does in my case), I figure it's better to just save that money for a nicer machine down the line. I often get asked to provide private tutorials for people with machine difficulties. I have been surprised at how many women with very expensive machines do not know how to take a bobbin case out and how to de-fluff their machine. One lady who was having problems with tension and bobbin threads breaking, had a machine so fluffed up I took a screwdriver to the well oiled, solid mass to show her that it was not part of the machine. Once serviced her machine ran perfectly! Before I entered the world of a bernina in 2003, I had a Viking machine that was top of the line (when I purchased it in 1971). I had aroutine cleaning done to it after a year. After that I never serviced it until it died in 2003. With the baby Bernina I service it once a year. With the Big Bertha Bernina 820 it counts stitches and recommends after 2 million stitches, which comes out to be about a year. Anyway you look at it once a year seems to be a good rule. I started with a once a year service, but the muppets over here don't seem to have much idea what is going on, so I guess I will take it when it breaks down. Or maybe Gordon could learn how to service it? Mine came with a free once a year for five years ( actually not free, but maby £100 so seemed like a good idea) but I've only done it once in 3.5 years – again, can't do without it! I do clean the fluff etc about every 100 hours, is that a mini service???? I got my Bernina for a wedding present from my hubby 26 years ago and I haven't err got round to err having it serviced yet cringe! BUT this is the year (I promise). I do clean and oil it regularly though! Ha, now I feel much better! At 5 years, I took my Bernina in for service when I started seeing black flecks mixed with the fluff. I was worried something was wrong with the belt–but turns out it was lint mixing with old oil. I change needles very often and defluff even often-er! My bernina is about 2 and it has HAD to go in when lights started coming on. I clean it daily and oil the bobbin case, change the needles very often but still that dreaded light came on. (I ignore the oil light as I oil what I can) I have my old Kenmore that is over 30 years old and I used to take it all apart and oil and clean and that was all it needed. This new stuff has to be taken in. I am not sure I am on board with that. It is really expensive and can take up to 3 weeks to get back…what does someone who sews almost everyday do? I can use another machine but seam allowances end up different. It's really worth it to have your machine serviced once a year, whether you use it or not (over use creates issues and under use does too). When you keep up on regular maintenance they can make slight adjustments in timing and other things, rather than fixing the huge problems that cause your sewing to come to a grinding halt and usually cost big bucks to repair. I still oil and clean regularly and I do change my needle all the time. I figure, it's about $1/needle which is $1 well spent if it keeps my timing right. I run two old machines that are full of sentimental value. They go like champs and I simply never want to replace them. With all that said, I had to move around to a few different shops to decide where to service them. My top choice closed, then my next try broke my machine! I found a new guy in the area and they do a wonderful job. I've had my machine for 3 and a half years. It's never been serviced. I've never oiled it either – though can't find anything in the manual about that, so possibly it doesn't need oiling? Every 100 hours sounds crazy! I oil and clean my machine regularly, but I'll probably wait until it starts giving me problems to get it properly serviced. 🙂 I took my first machine for full service after about a year, because it was having really bad tension issues. After a 3 week wait, it came back with the same issue. I'm reluctant to drop another $100 on servicing, unless I absolutely have to! My machines are serviced every 18 months- 2 years or thereabouts. 100 hours of sewing? Is he serious? My machine would be in every 5 or so months! Eeek! I had my Janome servied just recently after 2 and a half years. who knew that me bobbin case had a crack in it and i needed to replace the needle plate? I found out i could pay and extra $20 bucks for overnight service. Bonus! I was told to service it about every 2 years as long as i was taking care of it. 100 hours… That is over the top! I swap mine every 2-3 years to avoid servicing it 😉 Honestly though, it's never, which is a thing I worry about. Still, I've not had this machine a year and it has gone for repair when it tried to cook itself so I think I'm OK for now. I would like to service my own machine in the future, I've found a course it's just a case of doing it now. I sent it after it broke down! The man said it won't need a service for two years!? Unless it goes bad again of course…think it was serviced once before that – oops! Let sleeping (feed) dogs lie I say! My first machine was such a small cheapie that I never bothered, but I think I might make sure I get my big Janome serviced regularly. I de fluff it and change the needle fairly often, although I've never oiled it and now your making me worried that I should!?! I take mine in annually and I've wondered whether it really needs that. My service guys don't come out to the front so i never get a report on how things look in there! Tell me, did you pull out giant dust bunnies or was everything good in there!? Let me know if it was worth my time and money! I share/have access to three machines – a Brother that Mam got for her 21st birthday, the 'new one' (a New Home) that Mam got when I was eight(ish) and the Bernina that we got three/four years ago. The first two have been serviced once, about five years ago (a lovely man came to the house and sat in my kitchen for about an hour and a half and charged £25 per machine), the Bernina has never been serviced but gets a regular oil and clean/defluff. Having said that, I use my machine far, far less than other quilters I know as most of my sewing is done by hand. The Bernina will probably be serviced in the next couple of years but it's a fair trek to the man who services them so I'll have to see if I can drop it off and then go for a long wander round the shops/huge pot of tea before going back for it. 100 hours of sewing really doesn't sound like a lot of sewing between services!! Interesting. I take mine in every year or maybe every 6 months. But I clear out the bits I can reach at least once a week and change the needle often (and I buy titanium needles). One of my issues with these computerized machines is that one cannot clean them all through like the old metal ones.